How do you create a record in Fulcrum? 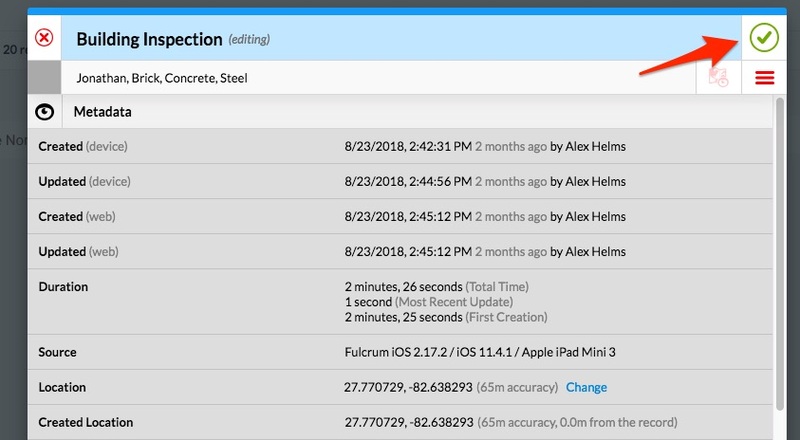 Creating a record in a form/app within the Fulcrum web app. Creating a record in Fulcrum's web app is pretty straightforward. When you first log into your user account on the web app. You will be taken to the homepage. From here, you can click on the 'records' button to the right of the name of the app that you wish to create records in. This will take you to the web app's record editor for that app. The record editor is the main view to see the data that has been collected in an app. In the upper right corner of the record editor you will see a green '+' sign. Clicking this will allow you to start the process of creating a new record within that app and will prompt users to set the location of the new record, and then proceed to fill out the fields. Once you have created a new record, set the location and fill out the fields you can click on the green check mark to save the record to the server.